Charlie (Mickey Rourke) is a restaurant manager and small-time hustler aspiring for more. Paulie (Eric Roberts) is his desperate, hotheaded cousin who thinks he may have just found it: the easiest money they’ll ever make, and it’s just sitting there! But the heist goes sour and attracts the ire of local mobsters. These two goombahs are taking huge risks, and their Little Italy lives start to feel a whole lot bigger. 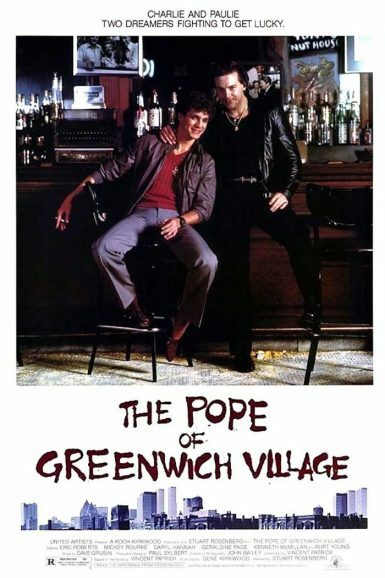 An irreverent coming-of-age tale and urban jungle crime story, The Pope of Greenwich Village captures the sensory experience of New York City, from the cut of a nice suit to wailing police sirens to the feeling of fifty thousand dollars right in your hand. View the full set of Spanish lobby cards for The Pope of Greenwich Village on the New Beverly forum. Johnny Depp is undercover special agent Joe Pistone, who infiltrates the mob as Donnie Brasco – “He’s a jewel guy.” Donnie is brought into the mafia crew by Lefty, a nuanced role by Al Pacino and the two men form a deep bond, with Lefty becoming a mob mentor to Donnie, “A wiseguy’s always right, even when he’s wrong.” Michael Madsen is formidable as Sonny Black, an ambitious, mid-level mob manager, that must make sure his blue-collar crew of Lefty, Donnie, Nicky (Bruno Kirby) and Paulie (James Russo) are kicking back enough “vig” to the men up the mob ladder above them. You won’t find any teased hair, eyeliner or eccentric wardrobe accessories on Depp as Brasco, just the tape recorder he hides in his boot, the leather jacket he wears to blend in and his soulful eyes that are constantly observing. The violence in Donnie Brasco is bloody and often unpredictable, with a dismemberment scene that would make Jeffrey Dahmer squeamish. 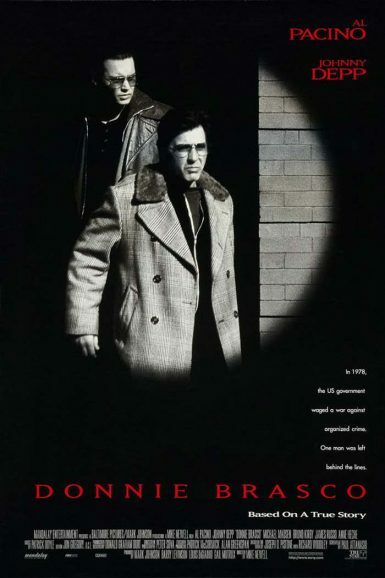 Garret Mathany discusses Donnie Brasco on the New Beverly blog.